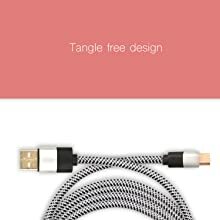 Long Cable length:Extend 6.6ft Long Cable provide more use space, You Can Easily Use Your Devices In The Bed or Sofa etc. Rapid Charge and Data Transmit:Data sync speeds are USB 2.0, so you’ll get up to 480 Mbps. 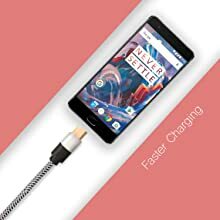 Compatible with Oneplus / Oneplus 2/Huawei Honor Magic/ Nexus 5X/ Nexus 6P/Le Eco Le 2/ New Macbook/Chromebook Pixel/Gionee S6/Meizu Pro 5/ Xiaomi Mi 4C/ Xiaomi Mi 5/ Leeco Le 1S/Leeco Le 2/ Le 2 Pro/Leeco Le Max 2/ Nokia N1 Tablet And Many More Type C Devices. Reversible Connector: you can finally wave goodbye to the frustration of plug in failures because your cable is in the wrong orientation. USB Type C connector allows you to plug in any direction, whose connector lasts longer than the normal one. Utilize all your current USB 2.0 charging bricks to charge your new USB-C devices. 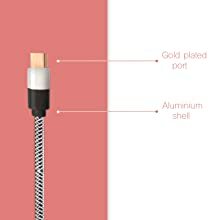 Gold Plated Aluminium Connectors avoids daily wear & tear , causing damage to your cables.It Performs Better than any regular cables in Charging and Data Transfer. Tangle-Free Braided Nylon: While cheap cables break after 6 months, Ours is Made of Strong, Flexible Nylon that endures heavy usage without constantly getting knotted up.Integrated Strain Relief Reinforcements Ensures it won’t break at the Connectors. Rapid Charge and Data Transmit:Data sync speeds are USB 2.0, so you’ll get up to 480 Mbps. 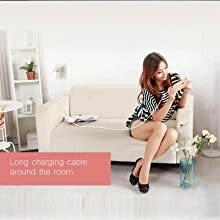 Perfect Length:6Ft length (2 Meters) is perfect for charging whatever you need to use them in office, car, home, hotel or anywhere else.